I took two others for this foul weather excursion into the High Sierra. It's a shame for 40 hour-a-week, working climbers like us to waste a three day holiday weekend. I wanted to explore the other peaks in the Palisades region. We backpacked the trail up North Fork of Big Pine Creek and set up a camp. For just the day, we navigated past Elinore Lake and climbed up toward the Clyde Glacier. The weather looked iffy, so we contented ourselves with just the view of the North Face of Norman Clyde Peak (photo right). It didn't look very easy to climb, and I was later to learn that it was a very respectable accomplishment to complete the route on that face. I had brought a light rope and some hardware, but much more was necessary than just that! We climbed down back to our camp near a route junction at a lower elevation. 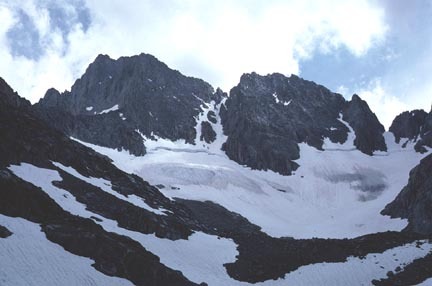 The next day, we attempted to climb Temple Crag (12,976'). We scrambled up the southeast slopes to reach a traverse across an exposed third class rock section. This leads to an easy class two chute. We climbed nearly to the top of the peak. The weather began to set in. Lightning struck the peaks to the east and south. I didn't want to miss bagging this peak, but the others were very worried about the lightning. I believed that if we waited, the weather might pass over. This might be only a morning storm, since it was then about 10 a.m., too early to give up for the day. 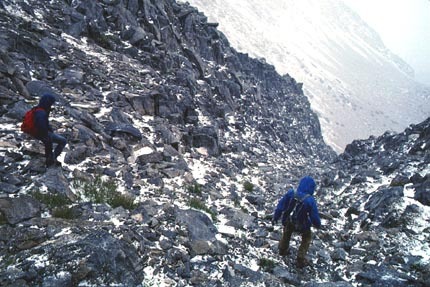 I solo-reconnoitered up to the main summit ridge, and came to a highly exposed step or jump-across. The summit was just a short ways away, if I could make this jump. The consequences of miscalculation and failure would be death. It was a long way down. I thought, and evaluated my chances. Even if I made the jump headed up, jumping back across later might be more dangerous. Snow was falling, and the rock was wet. There was nothing to hold onto on either side. Fortunately, I am a bit conservative, and erring on the side of safety is generally the best course. I am a bit of a "chicken," by other climbers, but then, I don't get into terrible accidents. Living to climb another day proves right for me, now having completed so many peak climbs. Others may do a climb, once, and call it at that. This is not a game of Russian Roulette, at least not for me! Returning to the two others, we waited a bit more, then I gave up on the weather and we all headed down. We had to be careful since new snow had fallen below us. Back safely to camp, we decided that the weather wouldn't improve in time for us to climb another peak here. We packed our stuff and headed back for the cars. Another climber advised us that the weather was better down lower. The sun broke out as we made the final retreat back down to my car. The radio report said that the weather might be better further north. I thusly drove us north on U.S. 395, and we camped somewhere on this crowded holiday weekend. The campgrounds are usually then full, but we found a spot. The next day, driving up to Minaret Summit at the end of CA 203, it seemed like a go for San Joaquin Mountain. This was an easy peak, and we didn't expect much trouble on this one. It would be good scouting for a ski ascent. Coming first to the Two Teats, described as a "sensual" rock formation in Roper's Guide, we climbed both points. The lower, western one was a good, short, class three climb, and had a register. The higher point was just a class 1 bump, and had nothing. 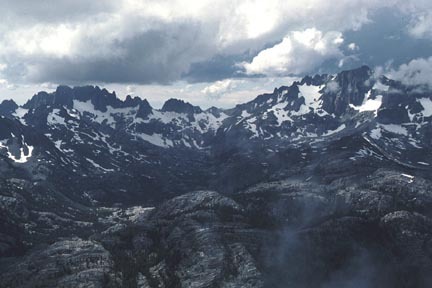 Continuing on to the summit of San Joaquin Mountain, we enjoyed the stormy view of the Minarets, Mt. Ritter and Banner Peak to the west. Reading the register, I saw that, in the spring or winter, some backcountry skiers came up from the north side, up Fern Creek, and that it was a great ski tour. Unbeknownst to me, then, I was to make that ski climb and descent twice in the next couple years. The weather held enough for our visibility on our easy hiking descent back south along San Joaquin Ridge. Passing Deadman Summit, we came to a dirt track beyond, and then arrived to my car at the Minaret Summit parking lot. The drive home was uneventful, and I was heartened to bag one peak on this three day holiday weekend. The stats on this one summit hike were about 2,900 feet gain over 12 miles round trip.